The overhead lunge is a weighted variation of the basic lunge that uses nearly every muscle group in your body. By holding weights overhead, you build upper- and lower-body strength, increase the power and propulsion of your legs, and improve core strength. The overhead lunge builds strength in your quadriceps and gluteus muscles, and improves balance, core stability, and proprioception (spatial orientation of your body). 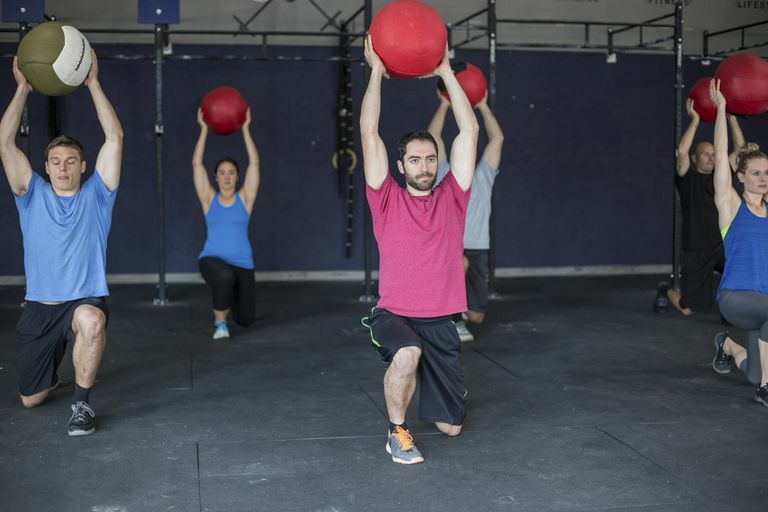 The exercise targets multiple muscle groups as you drive the weight up through the foot, knees, hips, core, and shoulders, and then forcefully unload it by driving down into a lunge position. As a stability exercise, overhead lunges isolate your quads and hamstrings by keeping the upper body controlled under the weight. The move also engages stabilizers in your shoulders (including the upper and lower trapezius) and forces your core muscles to lengthen and fully contract. The overhead lunge is a great way to challenge your balance as you shift your focus from one leg to the next, similar to when you're running, cross-country skiing, or cycling. This focus also benefits your abdominals and hip flexors. The overhead lunge is an advanced plyometric movement, so be sure to complete a warm-up or some basic movement prep, such as a quick core workout or a glute activation routine, before you begin. Even after a warm-up, the exercise requires control and a slow progression to ensure you are stabilized and balanced. Before you get started, choose a weight such as a weight plate, weighted bar, dumbbells, or medicine ball. Just be sure you can comfortably hold whichever one you select. Begin with your feet positioned shoulder-width apart and knees slightly bent. Inhale as you raise the weight above your head. Keep the weight directly overhead and centered between your shoulder joints. Exhale as you take a comfortable step forward into a deep lunge position. Inhale and pause to check your form. Your forward knee should remain over your forward foot and not in front of it. Exhale as you forcefully drive your forward heel into the ground. Inhale as you return yourself to the starting position. Perform 10 reps. Switch sides and repeat the same number of reps with your other leg stepped forward. Focus on maintaining your posture from start to finish. Keep your head level, your eyes straight ahead, your chest high, and your back flat. Do not bend your elbows or let your core sink. The heel of your front foot should not lift off of the ground. In addition to being integral to maintaining good posture, a strong core throughout the lifting of the weight, the lunge, and the return will keep you from fatiguing too quickly. Keeping your core engaged will also help you keep the movements slow and controlled to avoid injury. Overhead lunges look pretty straightforward, but they're a workout you'll definitely feel. That said, if you seem to be tiring fast, check that you're not short-stepping your lunge. If your knees move beyond your toes, you're unduly straining your muscles and your heel will lift off the floor, which can disrupt your balance. If you feel the weight "dropping" down as you lunge, you may be using more weight that you can comfortably lift. You want to perform the lunge while keeping your form strong—and that includes keeping the weight above your head. It can help to envision yourself pushing the weight up as you step forward and down into the lunge. If you're new to the overhead lunge, start with low or no weight until you are accustomed to the movement and can maintain proper form. Try practicing with a broomstick or stability ball. You can increase the intensity of the overhead lunge by simply doing more reps or sets at your starting weight. Then, if you feel ready, use more weight. However, you should only do this when you've fully mastered the movement behind the overhead lunge. If you can't do 10 reps with perfect form and control, drop to a lower weight. Doing more reps with proper form is better than fewer reps with poor form. You can also put a twist on this exercise by turning it into a walking lunge. As always, before you start or change up a workout routine, check with your doctor. Exercises that require weight lifting may not be right for you if you have certain injuries, conditions, or are recovering from surgery. In some cases, strength and weight training can be an important part of recovering from an injury. Ask your doctor, physical therapist, trainer, or fitness instructor about which exercises would benefit you.